After scoring yet another hundred in a chase, Indian captain Virat Kohli showered accolades on Rohit Sharma, who also smashed a hundred as India chased down 323 with ease. 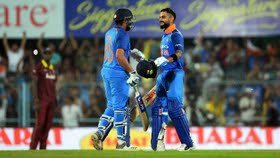 After scoring yet another hundred in a chase, Indian captain Virat Kohli showered accolades on Rohit Sharma, who also smashed a hundred as India chased down 323 with ease. Kohli said it is easy to chase any target with Rohit at the other end. Kohli (140) and Rohit (152 not out) featured in a a massive 246-run stand on Sunday. “It feels pretty good. It was very convincing for us. West Indies put up a really good total. 320 targets are very tricky, but we knew we could do it with a big partnership. It’s never too difficult when you have Rohit at the other end,” said Kohli in a PTI report. “Among the top three, I mostly take the anchor role because both Rohit and Shikhar are good stroke-makers,” he added. On his knock out in the middle, he said he had a lot of fun. “It was one of those days where I felt good and I told Rohit I will continue to bat this way positively and maybe you can play the anchor role,” he said. “When Rayudu came he took that role and Rohit took over from me. I think that’s what ODI batting is all about. It’s about communication and batting in partnerships,” Kohli went on to explain.